Use these quick tips to discover and live your life mission. Everyone wants to know why they’re here and what their purpose is. Do you know yours? So in our SHIFT Challenge, our fourth shift is to Live Your Life Mission. First of all, you need to know that there is a reason you’re here on this planet. so that you can reveal God’s love to others in completely unique and creative ways. There are specific people around you that you can encourage, love, and bring life to every day in tiny ways. What is a Life Mission? When you hear the words “life mission”, you may feel a bit overwhelmed. A life mission is a simple statement (or paragraph) that clarifies who you are and what you want to do in life. It’s also important to know that your life mission is a journey and will shift a little over time as you walk through different seasons. Why Do I Need a Life Mission? increase your intimacy with God as you pray about your life mission and work with Him to accomplish it. Knowing your life mission helps you to find a higher purpose in everything you do. What are my current roles? List nouns that describe you and your most important roles such as wife, mother, teacher, encourager, organizer, coach, chef, etc. What are my top priorities for this season? List action verbs that describe your most important actions in this season of life. For example: date my husband; nurture, teach and feed my children; pay off as much debt as possible; finish my degree. The more specific you can be with this list, the easier it will be to craft your mission statement. What are my unique strengths, talents, gifts and personality quirks? List adjectives that describe you. What do you love doing? What do people say you are good at doing? What makes you unique? What are the tasks/activities that only I can do to accomplish these top priorities? This may be the most challenging part of crafting your mission statement, but it’s probably also the most important. To fully live out your purpose you need to determine what tasks and activities only you can do. Using words, ideas and phrases from these three elements, create a paragraph or a series of statements that describe your life mission in this season of life. As a child of God, I want to maintain an intimate spiritual connection with God at all times so I can receive His love for me and show His love to others. As a wife, I want to foster a vibrant, loving and respect-filled relationship with my husband and help him to become all that he is created to be. As a mom, I want to encourage, nurture and counsel my children to have a real and intimate relationship with God so they can fulfill their individual destinies in Him. As a creative, down-to-earth encourager, I want to enable others to connect to God in real ways so they can successfully accomplish all that God has called them to. Remember, this is a journey. Just begin by writing down your thoughts for now and you can work on your mission statement over time. Knowing that you were created to be loved and to love others brings a higher purpose to everything you do. The mundane and monotonous can become sacred. When we focus on the “why” behind those tasks, we can do them with a more positive attitude and more joy. As I wash my husband’s work clothes, I can be thankful that he has a job and pray for him while he’s there. As I plan our meals for the week, I can think about how I’m nurturing my family by feeding them. 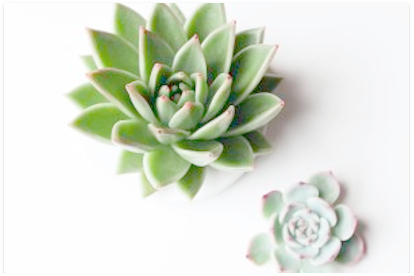 As I declutter my home, I can focus on how I want to create a restful space for my family and everyone who enters. As you go to work, spend time with your family and take care of all those tasks on the to-do list, try to remember the bigger picture of why you’re doing what you do. This week we’re going to begin thinking about all of the aspects of our life through the lens of our life mission and purpose. We are going to think about the “why” behind what we’re doing and do everything with your life mission in mind. Are you spending your money with your life mission in mind? Do you need to make a purchase to further your purpose? Can you give to a cause you believe in or save to create an unforgettable experience for your family? Let your life mission inform your spending decisions this week. How can you view your home with a higher purpose in mind? Focus on creating a peaceful haven for your family. Take some baked goods to a neighbor to initiate a relationship. Invite a young woman who needs a listening ear over for coffee. Begin to see your home as a tool to move toward a higher calling. Believe that God created you to receive His love and think about each of the ways you are completely unique from those around you. Rest in His personal love for you and look for ways He is revealing that love to you. 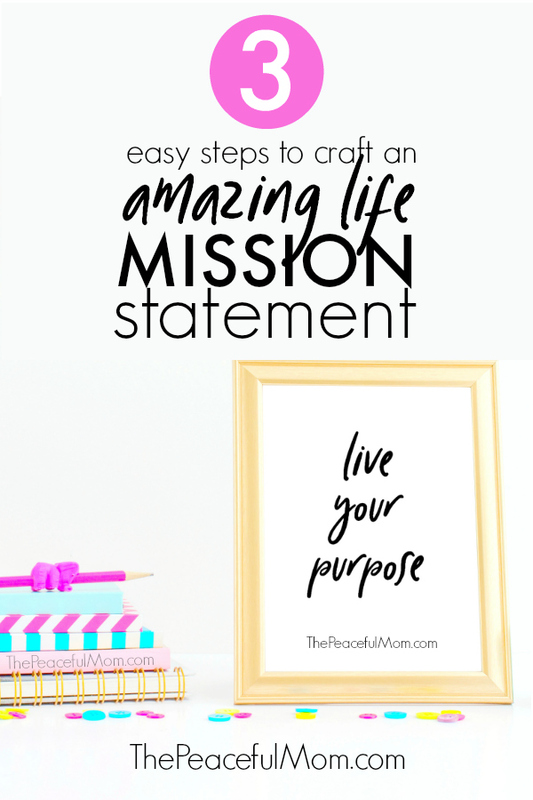 Does your family have a mission statement? This week, think about what the purpose of your family could be. Does your family like to laugh a lot and play games? Are you all talented musically? Think about you can use your family culture to encourage and influence others. Let’s be purposeful with our time this week by making a plan for our week with our purpose and calling in mind. If a top priority is nurturing your marriage, schedule a specific time to do something fun with your husband. Create a habit of praying for your children before they leave for the day so that they can focus on their purpose. Remember, SHIFT is about refocusing on our top priorities and realigning ourselves with our values, not about stress. 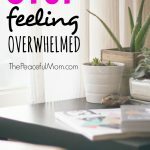 If you’re feeling overwhelmed, begin ONE of the lists I mention above and just begin thinking about your life mission and purpose. Writing this post motivated me to write my mission down instead of just having it in the back of my mind. I’m going to write my life mission statement on a sticky note and post it on the current weekly pages in my Joyful Life Planner. P.S. – It’s a good idea to post your mission statement somewhere you will see it on a regular basis.